CBS has pulled a report saying Colin Kaepernick would stand for the national anthem if he played for an NFL team again. On Sunday, Oct. 8, CBS Sports NFL reporter Jason La Canfora tweeted that he didn’t ask Kaepernick, the former San Francisco 49ers quarterback about standing during the anthem. His reversal came after CBS anchor James Brown asked him about kneeling. He later tweeted that he’s not sure what Kaepernick would do now. 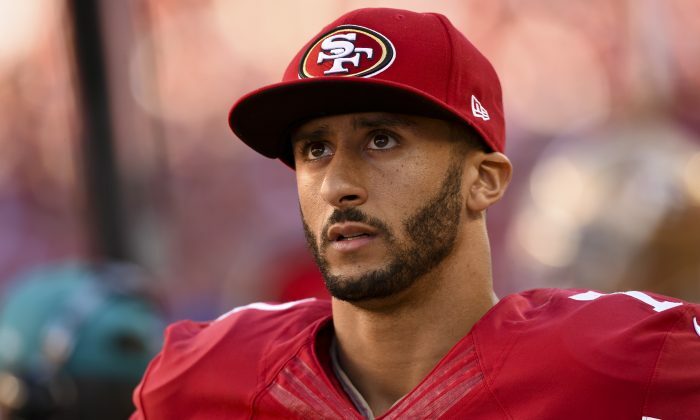 Having been out of action for nearly a year, Kaepernick still wants to play in the NFL. According to CBS, he’s getting up at 4 a.m. to practice and is throwing more than 100 passes per day. Kaepernick has been an unsigned free agent since 2016. Last season, he started kneeling during the national anthem to protest what he views as police brutality and racial injustice. A wave of public backlash ensued, with some fans saying that they would boycott. Last month, President Donald Trump slammed the NFL, saying that ratings would go down over the protests. He also said that players who don’t stand should be fired. On Sunday, Vice President Mike Pence walked out of a 49ers-Indianapolis Colts game after players took part in the protest. Trump wrote on Monday that Pence’s plans to attend the game were planned for some time. “The trip by @VP Pence was long planned. He is receiving great praise for leaving game after the players showed such disrespect for country!” he tweeted. “While everyone is entitled to their own opinions, I don’t think it’s too much to ask NFL players to respect the Flag and our National Anthem. I stand with President Trump, I stand with our soldiers, and I will always stand for our Flag and our National Anthem,” Pence said on Twitter.